By now you might have noticed that I have been making a lot of comfort style foods. I am cold and it’s been raining, so that’s part of it. You will also be seeing a mix of different styles and culture confusion on my part. Growing up in Northern California, being part of an Italian-American heritage and, add to that married to a Pakistani well what do you expect?! OK, so I have to throw my German, Scottish Heritage in too or if my Mom reads this I will never hear the end of it! Sorry Mom, Italian trumps everything! 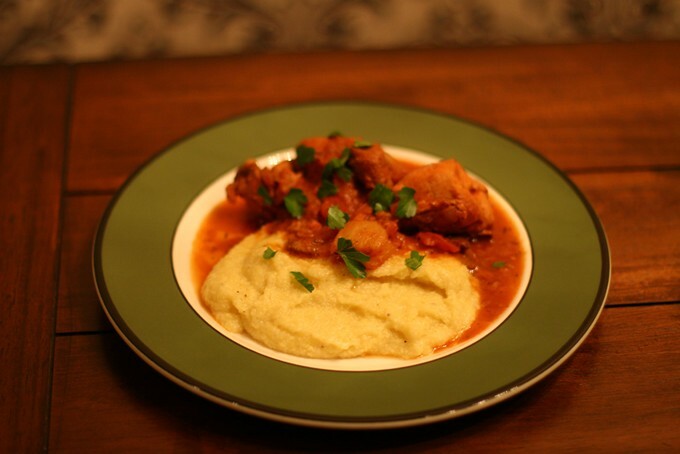 So for today, staying true to that statement, I will be sharing my recipe for Chicken Cacciatore. I like using fennel in this during the winter. You could omit it if your not a fan but it does not over power at all. 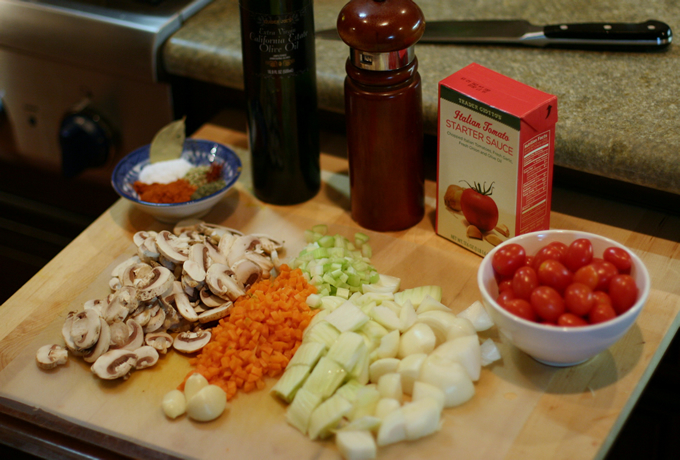 I like to keep some of the vegetables diced in large cubes, about 1 inch square or you will loose them to the long simmer, and some small diced so they become part of the sauce. 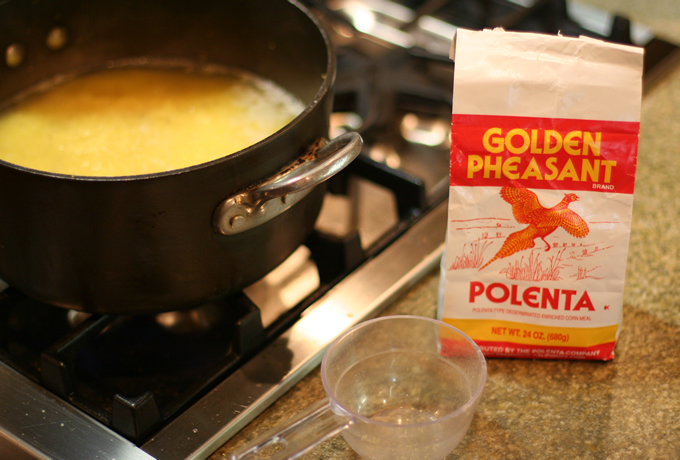 I paired this with polenta but you could also serve this with mashed potatoes or rice if that’s your thing. I also add two roasted red bell peppers to this dish. I love the slight smokey, sweetness they impart. You could buy them in a jar but roasting them at home is really simple and cheaper too. I have a gas flame but if you have an electric or other cook top than the broiler oven or BBQ works great. Ugly, but you get the point! Preheat oven to 350˚F with the rack in the middle. Place in a small dish and set aside. 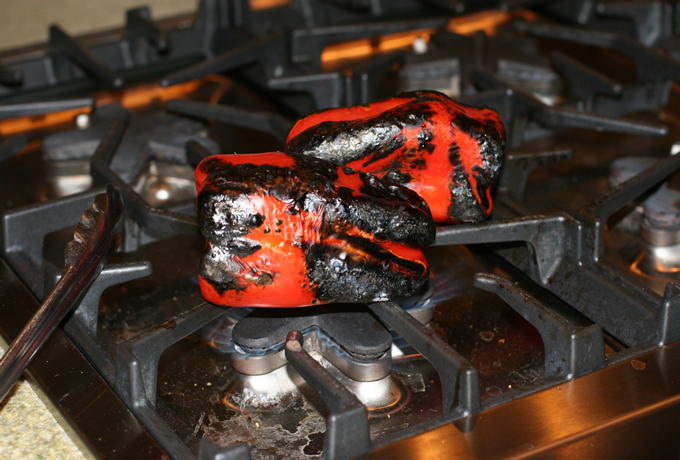 2 red bell peppers, roasted, peeled, seeded, 1 chopped large dice/1 set aside. Puree the 1 roasted bell pepper and 12 ounce can of tomatoes, set aside. 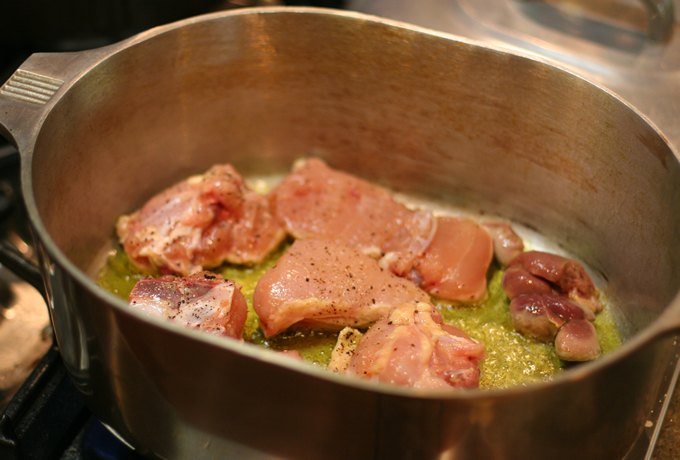 Sprinkle the cut chicken with salt and pepper and heat the oil in a dutch oven over medium-high heat. Brown the chicken pieces on both sides in two batches and reserve on a plate. Next add the onion, fennel, carrot, celery, salt and pepper to taste to the same dutch oven and saute over medium heat until slightly soft, about 2-3 minutes. 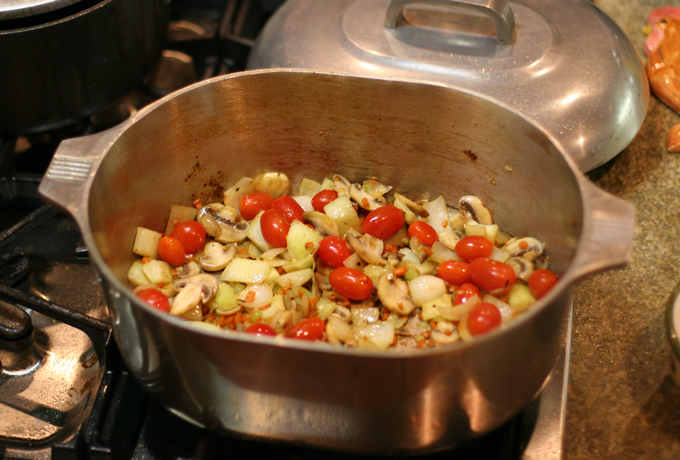 Now add the mushrooms, cherry tomatoes and garlic and continue to saute about 3 minuets. Add the spice mixture and stir to combined allowing the spices to open up. Now add the red wine or 1/2 cup of chicken stock, turn up the heat to high and reduce by half. Don’t take your eyes to far at this point because 1/2 cup isn’t that much. Once the liquid has reduced bring the heat down to medium-high, add the roasted bell pepper and tomato puree. Now add the chicken stock. Stir to combine and then add the browned chicken pieces with their juices back to the pot. Bring to a boil, taste for seasoning, adding salt and pepper to taste and adjust spices if necessary and if you are omitting the red wine then add the juice from the 1/2 lemon. Cover pot with lid and finish cooking in the oven for about 1 hour.